Missing is a 1982 film directed by Costa-Gavras, starring Jack Lemmon, Sissy Spacek, Melanie Mayron, John Shea and Charles Cioffi. It is based on the true story of American journalist Charles Horman who disappeared in the bloody aftermath of the coup against President Salvador Allende in 1973. His father and wife search in vain to determine his fate. The film is based on a book first published under the title The Execution of Charles Horman: An American Sacrifice (1978) by Thomas Hauser (it was later republished under the title Missing in 1982). The film, released on February 12, 1982, was based on the 1982 book Missing by Thomas Hauser (ISBN 0140064532). 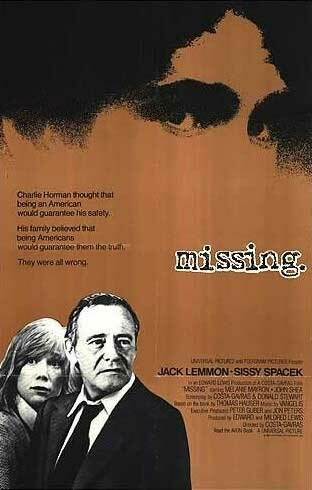 Missing won the Academy Award for Writing Adapted Screenplay, and was nominated for Best Actor in a Leading Role (Jack Lemmon), Best Actress in a Leading Role (Sissy Spacek) and Best Picture. The film won the 1982 Palme d'Or (Golden Palm) at the Cannes Film Festival. The film grossed 14 million dollars in the US, making it the 55th top-grossing movie for 1982. Missing features a haunting score by the Greek electronic composer Vangelis.